Newbury Street is the most trendy area of the city. Themes of stores include men's and women's fashions, children's clothes, shoes, accessories, and maternity clothes. Specialty stores include crafts, beauty products, books, music, video, watches, and jewelry. There are beauty spas, tanning salons, hair stylists, and nail salons on Newbury Street. Many restaurants and bars line the street, several of which have cafe style sidewalk tables during summer. Many stores offer world famous designer apparel and accessories, for wealthier residents and tourists. 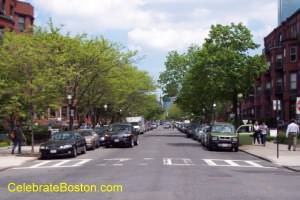 Newbury Street (and the Back Bay) is a very expensive area of the city. Back in the 80s, the area was often referred to as Yuppieville. In the 90s, it was the center of trendy French Eurotrash style and fashion. The first Newbury Comics store was located on Newbury Street, and in the early 80s one could search through racks there of punk rock 45 rpm records or buy spandex pants as new-wave music became popular. The street is minimally pretentious, and is a super place to shop or to just stroll down. Many commuters walk Newbury Street and skip a few stops on the subway, just to get exercise and enjoy the style. The intersection of Newbury and Dartmouth Streets is just one block south of Copley Square, which is considered the bustling center of the Back Bay District. The historic Boston Public Library McKim Building, Trinity Church, Plywood Palace, and Copley Place are located in Copley Square. Many First Night events occur in the square each New Year's Eve. A few blocks west on Boylston Street are the Prudential Center and Hynes Convention Center attractions. Just to the east are Boston Public Garden, and Cheers Beacon Hill, made famous by the long-running TV show. Newbury Street also parallels the Esplanade Park along the Charles River, where free concerts take place during summer at the Hatch Shell. An interesting note about the Back Bay District is the layout of the streets. Boylston and Newbury Streets run east-west, and the north-south streets are named alphabetically: Arlington, Berkeley, Clarendon, Dartmouth, Exeter, Fairfield, Gloucester, and Hereford. It's one of the few places in the city where the street names were logically designed! Walking Directions: Exit the station (it's located at Boylston and Dartmouth Streets). Walk one block north up Dartmouth Street to Newbury Street. Stores and shops line Newbury Street for several blocks east and west of this intersection. Arlington Station (Green Line) is located at the west end of the shopping district, and Hynes Station (Green Line B, C, D Trams) is located on the west end.